Israeli soldiers abducted, on Sunday at dawn, nine Palestinians, including children, from their homes in the West Bank governorates of Bethlehem and Ramallah, the Palestinian Prisoners’ Society (PPS) has reported. 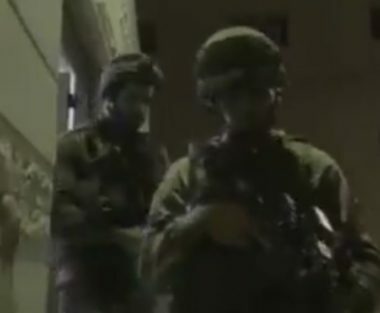 The PPS said dozens of soldiers invaded the towns of Ni’lin and Turmus Ayya, before storming and violently searching many homes, and abducted six Palestinians, including two children. It identified the abducted Palestinains as Mo’taz Salah al-Khawaja, Mohammad Salah al-Khawaja, Mohammad Hatem al-Khawaja and Ibrahim Srour, all from Ni’lin, in addition to Mohammad Ali, 15, and Anas Majed Abdul-Hafith, 16, from Turmus Ayya. On Sunday morning, the soldiers installed a military roadblock at the main entrance of Turmus Ayya and fired dozens of gas bombs and concussion grenades at Palestinians who gathered there awaiting the transfer of the corpse of Hamdi Taleb Sa’ada Na’san, 38, to his village, al-Mughayyir, east of Ramallah. It is worth mentioning hat Na’san was killed by Israeli soldiers, Saturday, while at least 30 others were injured, after a group of illegal colonialist settlers attempted to invade the northern part of the al-Mughayyir village. Furthermore, the soldiers invaded the Deheishe refugee camp, south of Bethlehem, also searched homes and abducted Saed Abu Hadrous, Shadi Abu Hadrous and Mohammad Jalal Abu Hadrous.